Shoe Doctor, PhD: Cooking with the Shoe Doctor: Pork chop dinner! Cooking with the Shoe Doctor: Pork chop dinner! So of course, I had to do my favorite activity when breaking in my new shoes: cooking! Today I will be sharing with you a pork chop dinner recipe! This recipe will actually be less of a recipe and more of a 'these are the techniques and things you need, use them as you see best' dealio. First, season the pork chops with salt, pepper, and italian seasoning. Let the seasoning tenderize the meat while you halve the baby portabella mushrooms. It is always very important that meat gets properly salted before cooking. Heat up a saucepan at medium heat and preheat your oven to 500 F degrees (or set to 'broil'). Add ~2 tablespoons of olive oil. Once the oil is heated up, add pork chops and cook on one side until lightly brown then flip to the other side and cook until also lightly brown. This should take you no more than 10 minutes. Do not fully cook the pork chops in the pan. Transfer the pork chops to an oven pan that is large enough so that no pork chop overlaps with another. Why do this step? Quickly cooking the outside of the pork chops prior to baking them will help seal in the natural juices. Poorly cooked pork chops are often dry because this cut of meat doesn't have much fat in it. Bake the pork chops until throughly cooked, ~15 to 20 minutes. 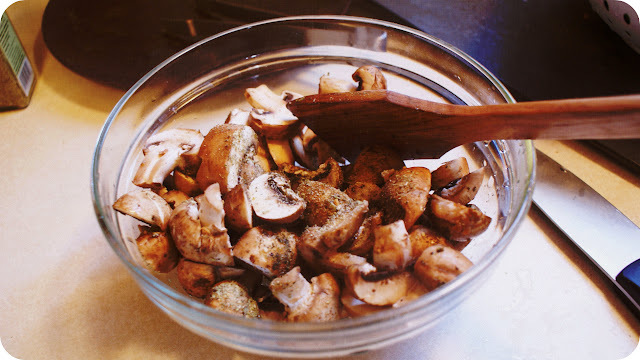 Put the cut up mushrooms in a bowl and add a little bit of olive oil (~ 1-2 tbsps). Coat evenly and then lightly season with the Italian seasoning and lightly season with salt. Baby portabellas are very delicious and flavorful, so they do not need much salt. Cook the mushrooms in the same pan as the porkchops, they will absorb some of the flavor of the meat. Do not overcook! Here's a tip: cook until the mushrooms start to become soft, then quickly transfer them to a serving dish. The mushrooms will finish cooking in the dish because of remnant heat. Keep the pan hot for the spinach! 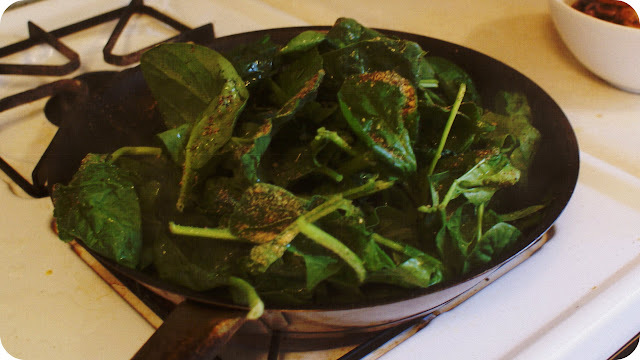 Pour the entire bag of spinach into your pan. Don't be afraid that the spinach looks like it is overflowing in the pan. Quickly add some Italian seasoning, garlic, and a little bit of salt - like the mushrooms, spinach is very flavorful on it's own and do not need a lot of salt - then stir stir stir as much as you can. One mistake people often make with spinach is overcooking it. If spinach is overcooked, it will leave a coating in your mouth and make your mouth feel really dry. 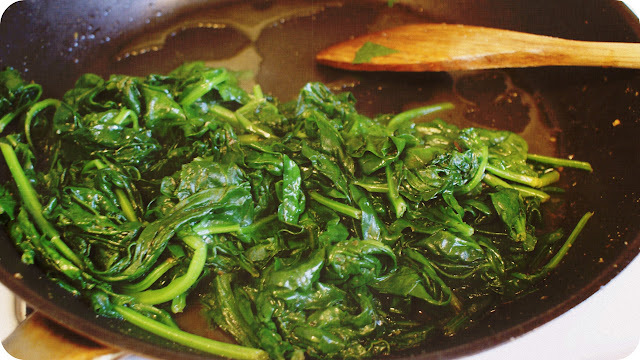 To avoid overcooking the spinach, only cook until the spinach starts to reduce in size. This should be within minutes of adding the spinach to the hot pan. Once you notice the spinach reducing in size, move the pan over to a cooler area and continue stirring to evenly distribute the remnant heat from the pan. This will ensure that your spinach does not get overcooked and will not leave a 'dry mouth' feeling. Once the veggies are cooked, the pork chops should be done too. Check with a meat thermometer or slice a pork chop in half to make sure. 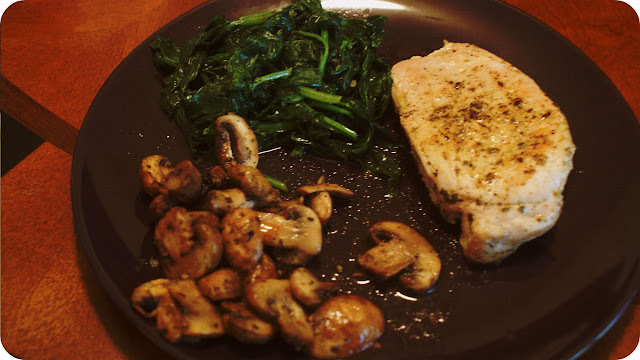 Plate your pork chops, spinach, and mushrooms and you've got a complete main dish with flavors that complement each other very well! Mmmmmmmm. So delicious!!! My Kaylas were still a bit snug (less than before though) after this cooking session, so I will just have to keep breaking her in! I hope you enjoyed cooking with the Shoe Doctor! you know, I've never been brave enough to try the ice trick on any of my shoes, but these snakeskin kaylas may need it!!! They are much tighter than the coral ones.